Prepare vegetables (peppers, zucchini, green onions, tomatoes, and basil -- and whatever other veggies your family likes) and place in an appropriately sized plastic food storage container with tight-fitting lid. Drizzle veggies mix liberally with olive oil and then with balsamic vinegar. Sprinkle seasoned salt and pepper liberally over all.Place lid on container and shake to coat all veggies with seasonings. Let stand 30 minutes. Remove vegetables from grill into a bowl. Add cubes of gorgonzola cheese and toss lightly. 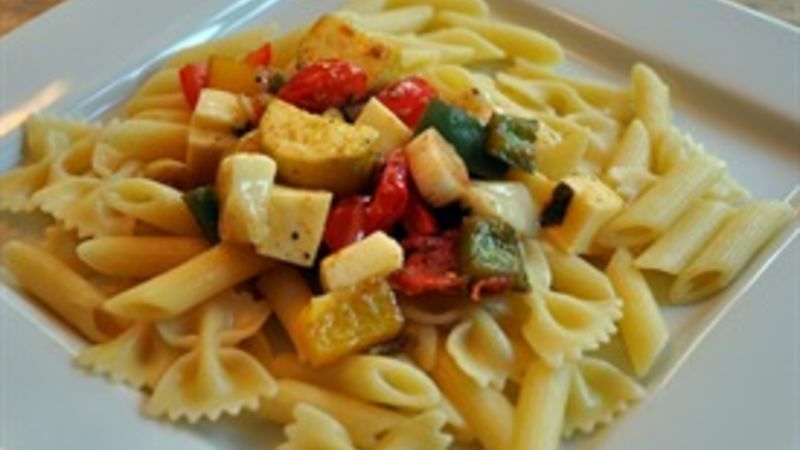 Spoon vegetable-cheese mix over pasta. Garnish with freshly grated parmesan cheese over the top.